The Meetings are kind of the high point of the physical anthropologist’s year. As one of my colleagues described it, “Its like a vacation, but with science!” There’s a lot of schmoozing, boozing, and staying up very late at night. All day long, from about 8am-6pm, you’re going to talks and looking at posters: alternately getting yourself all revved up about exciting new research or becoming disgusted with people who are jumping the shark. You see people that you may have once been really close to but you’ve both gone to different places and now see each other only once a year. You might stay up until 2am talking about the proportion of genetic variation to environmental variation in life history traits, while drinking obscenely overpriced Sam Adams from the hotel bar. Its a 4-day ultra-marathon adrenaline rush. 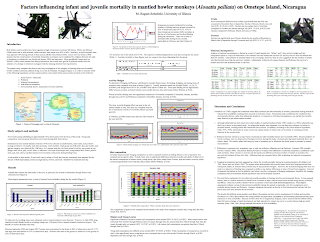 I presented a poster this year on infant and juvenile mortality in howler monkeys, and I’ve been extremely stressed about it since I submitted the abstract 7 months ago. My major source of stress was that the initial abstract I submitted ended not panning out and I had to change everything, including the title of my presentation. People often times make changes to what they have submitted, but in my case it was extreme. My paper was supposed be about how seasonality influenced the risk of dog attacks on howlers: specifically, risk of dog predation was elevated during the dry season. As I kept trying to put this together I realized that even though it was probably true, I didn’t really have the right kind of data to back up these claims. So I had to change the whole thing. At least twice a week for the last 7 months, I have woken up in the middle of the night hyperventilating about this. For some reason, I was paranoid that I was going to get into really big trouble from the scientific community (or maybe just from SL) for presenting something completely different than what I had submitted. The super mini version of my poster. But it ended up okay. The meetings are such a tour de force that no one really scrutinized my abstract and compared it to the poster I presented, so for the first time since September, I can breathe a sigh of relief. I did have a couple of really big name people come up to me and talk about my poster for a long time, which was kind of surprising. Also, everybody was really amazed at the high mortality rate of infants and juveniles at this site: about 50% of all infants and juveniles in my study groups died. In all honesty, I didn’t think that was too terribly out of line with what has been published for howlers. But when one of the biggest names in primatology (who has studied howlers since before I was born) told me that that was really high, I am led to believe that either something really weird is going on on Ometepe, or I have seriously miscalculated. As for the rest of the meetings, there were parts that enthralled me to no end, and parts that seriously jumped the shark. The best session I attended was on primate fall-back foods (foods they have to fall back to during lean parts of the year) and was chaired by no other than B.W.—the master of toughness testing, without whom none of my dissertation fieldwork would have been possible. A lot of really great people gave talks at this session, including my all-time primatological hero, S. Altmann. He’s been doing primatology for over 50 years, and his massive longitudinal study on the ontogeny of baboon feeding behavior served as the basis of my own dissertation project. I got to speak with him briefly after his talk, but unfortunately I was so awestruck I came across like a babbling fool, so hopefully I’ll have a chance to meet him again someday when I am more coherent. Aside from seeing Altmann, getting 2 hugs from BW, as well as my yearly hug from BGR, the best part of the meetings was all the quality time I got to spend with the other grad students in the program: we’re a good bunch. At any rate, the meetings were a success overall. Now that they are finished, I hope my HPA axis returns to baseline functioning and I can begin to focus my attention on all the other areas where it is needed. Thanks for reading! While I do have to admit that a good bit of this went over my head, it sounds like you had a very successful round of meetings. I can't wait to see you this weekend and hear more! Liss: Sounds like a great trip for you. Making contacts are the most important thing in getting great jobs. The next thing after our dissertation is to get a great job in a location, where Mom and I can visit, like a warm place in the winter. Very interesting reading -- but, like Amy, it's pretty much beyond my wide range of wisdom and comprehension!! However, I've concluded that you do love what you're doing and have already established your credibility with lots of others! Glad to hear you can relax now and get on with enjoying the coming season! Such a sweet picture of little Scooby.